Good Quality Products We constantly research and improve our products to ensure we can always supply you with great quality products. We listen to your feedback and work closely with our suppliers to consistently maintain excellent standards across all of our ranges. Our products are used with confidence in Care Homes and Children's Nurseries throughout the UK, so you can be sure we will not let you down. Amazingly Low Prices Our aim is to use high volumes to keep our prices low rather than charging high prices and only sell a little. It's the old method of pile it high and sell it cheap. That gives you good value for money and we get to cover our low overheads by selling lots of volume. Gompels HealthCare Ltd has consistently been (and will be) one of the lowest price suppliers in the market. If you would like us to prove it to you we will happily do a price comparison and show you on a like for like basis how much you will save by joining our 1000's of customers who shop with us every week. Free Packing & Handling Over £50 We offer free packing & handling for orders over £50 (ex VAT) for delivery to the UK mainland. Late 5pm cut-off for NEXT Day Delivery We have an industry leading cut-off time of 5pm for next day delivery! There aren't any reviews for this product yet. If you have one, we'd love to hear it. We offer industry leading next working day delivery on orders place before 5pm! Check out the timer above to see how long you have left until today's cut-off. Please note that if you are wanting delivery to Scotland our cut-off is a bit earlier at 3pm. Check out the full Delivery & Returns policy for all of the information on delivery and returns. This product doesn't fall into the criteria for being eligible for VAT exemption, so we are unable to offer VAT relief. Paired with our Aerosol Air Freshener Dispenser, our Air Freshener Refill Canisters fill the rooms of your house with delightful senses that will have your nose buds twitching for more. Bringing a light freshness to any room, our Fresh Linen fragrance fills any room with the warm scents of just-washed laundry. 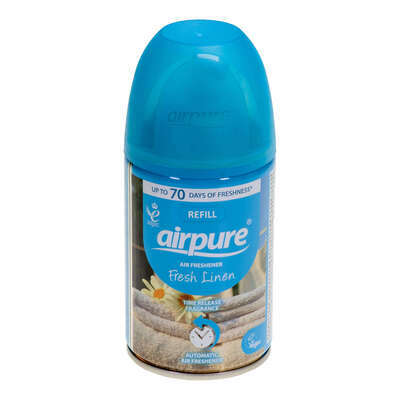 Designed to provide long-lasting fresh mist with just a single spray, these automate replacement canisters are ideal for use in bathrooms or public areas and are easy to replace when empty. New website features! We now offer order reminders and product subscriptions for our registered customers.